February 6, 2018, 8:45 AM · Imagine performing spinal surgery that will allow a young woman to walk again. Then, later that day, performing a second surgery on a professional violinist to relieve debilitating lower back pain. Next, rounds at two hospitals, office visits, and clinical work. Finally, home for the evening with the ever-present pager attached at the hip. But the day is hardly over for Dr. David John Yeh, a California-based neurosurgeon who surgically treats brain and spine problems. He's got a date... and it's with Kreutzer. Yes, Dr. Yeh is not only a highly respected surgeon, he’s also an accomplished violinist who is just as likely to be seen with his fiddle as his scalpel. When I heard he was going to perform in my town (Knoxville, Tenn.), I couldn’t wait to meet him and hear him play. And he completely shattered all my preconceived notions. Picture a stereotypical neurosurgeon straight out of central casting, then conjure up the polar opposite. The good doctor could be age 25 or 45. It depends entirely on what he's talking about. A smile can instantly erase a decade from his face. His shoulder length dark hair is dusted with gray. He's trim and fashionable in pants and a jacket that are pretending to be a suit while looking far cooler. And then there are the boots with a skull image embroidered on the side. (I’m not kidding.) If you think his persona sounds contrived, trust me, it isn't. David is as natural and organic in his presentation as he is in his approach to music and medicine. And he’s as thoughtful and sincere as he is talented and accomplished. A product of the public school system in Knoxville, Tennessee, David began violin at age 10 in a school string program. He started studying privately a few years later after a move to Chattanooga, and went on to earn his college degree in violin performance at the University of New Orleans. (His senior thesis, titled "Neurophysiology of Violin Playing," certainly forecast things to come.) But unlike most music majors, he completed all the requisite math and science courses needed to qualify as "pre-med." His father, Stephen Yeh, an engineer with the Tennessee Valley Authority, made sure of it. As David explained his father’s rationale, "Think of a young violinist practicing Carl Flesch. Once you master it, you can start to explore what the violin has to offer. The same is true in learning math and science fundamentals." And that rationale proved to be the golden ticket for David — he became a first-class surgeon and musician. So why the official career detour from music to medicine? The summer after David’s junior year in college, he participated in Charles Castleman’s prestigious summer quartet program. He heard a 12-year old boy perform Ravel’s fiendishly difficult Tzigane, a piece David had been struggling with for months. According to David, "This kid didn’t even tune his violin. Yet, Ravel was effortless for him. Call it charisma, maybe technique, but it was extraordinary." After hearing the young boy play, David realized, without regret, that he needed to do something else. "If you have humility, you realize certain people have something you just don’t have." David wanted to find for himself what that boy had found — the natural intersection of talent, skill, interest, and passion. David met with faculty members who said the only missing link for applying to medical school was the MCAT. He was fortunate that his violin professor, Jeff Cox, made sure he understood there were "many ways to have a rewarding musical life short of being a concert violinist." So, off to medical school David went, violin in hand. When David got to medical school, he initially focused on the technical aspects of study, just as he had done with violin. He quickly realized he had found in medicine what that young boy had in the violin. Medicine came naturally to him. It was like a river that was destined to flow in a certain direction. "Lo and behold, the skills-set necessary to be a good violinist were very similar to those required of being a surgeon — the most important of which was the ability to concentrate for long periods of time." David played in the local orchestra throughout his years in medical school and ultimately became a member of the orchestra’s Board. It became his mission to "preserve this fantastic music and make a financial contribution toward its continuance. I wanted people to love this repertoire." And he would soon have the financial means to help make that happen. David is now part of a thriving neurological practice in Central Coast California. He believes his musical training makes him a better listener and more compassionate toward his patients. In turn, his patients see him as a more balanced person because of his music. "Whether I’m discussing an issue with your spine or the difficulty negotiating the fugue in Schumann’s piano quartet, it’s a similar conversation. We’re trying to figure out how to fix a problem." David is quick to say that one of the great frustrations of being a surgeon is the fact that aging is the enemy of us all. "Surgery can’t fix everything because the machine — our body — keeps getting older. It’s humbling to fix something surgically, but realize that even though you’ve done your job very well, the aging process continues and the patient may have more problems over time." That said, his face lights up when he talks about his success stories. Take Tanja, for example, who collapsed one day at work. She simply fell down without explanation, and it happened again later that day. Tanja saw multiple specialists — heart, vision, ENT — before finding David. By this point, she had quit her job as an in-home care specialist since she couldn’t rely on her ability to stand without falling. Her legs simply gave out from under her without any notice or apparent reason. She was in excruciating pain and her weight was down to 85 pounds. Her greatest fear was Multiple Sclerosis. After a battery of tests, David made a different diagnosis. He began to prepare Tanja emotionally for what would be an extremely difficult surgery, specifically, a thoracotomy with an excision of the central thoracic herniated disk. "By the time I met Dr. Yeh," Tanja recalled, "I was sick of doctors. But he was unusually kind. He listened to me. He let me cry. Then he calmly told me that if I didn’t have surgery soon I could be paralyzed. He made it clear I could go elsewhere for surgery, but he was confident in his team." David always weighs the risks and rewards of his surgical interventions. Clearly, if you can’t walk before surgery and you can after, the risk was well worth it. And that was the case for Tanja. As David says, "In medicine, there are times you absolutely have to believe you’re right. But you know that’s not the case one hundred percent of the time. So, humility is important. You have to get out of the way of your own ego." When I met David, the question front and center in my mind was how he could possibly find the time to practice? I had heard him play (Schumann’s Piano Quartet in E Flat, no less) and it was remarkable. He more than held his own in a group of highly-skilled professionals. His strategy for practice is basic, but seems ideal for busy people. It’s all about maximizing the time you have, regardless of how limited that may be. If he just has a few minutes, he focuses on one short passage — maybe eight bars. "Over time, if you’re disciplined, you can get through an entire piece." Alternatively, he’ll play scales for 10 minutes or work on vibrato exercises. If he’s preparing to play in public, he practices every day, even if that means taking his violin to the office and practicing during breaks. If he’s feeling particularly motivated, David plays Kreutzer etudes on viola. Yes, viola — an instrument he started playing relatively late and finds a more "supportive" instrument than the violin. David believes that when music flows between a musician and the audience, there is a greater understanding of life. Perspectives are enriched and a sense of history is shared. He knows first-hand that making music is inherently difficult and the challenges are endless. And he certainly knows the same is true in medicine. "What bonds us together as humans is that we suffer the same maladies. Whether it’s Beethoven or the butcher down the street. We are fighting against an aging machine that simply can’t be stopped. Both pursuits — music and medicine — are humbling. Both pursuits are rewarding. Both pursuits add to the quality of life." Today David is firmly ensconced in his medical career. 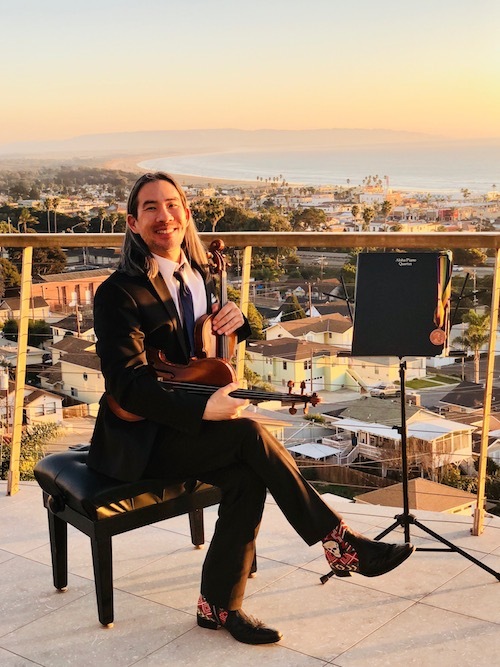 He’s active in his community and financially sponsors multiple classical music groups in his area, including Festival Mozaic, Orchestra Novo, and the San Luis Obispo Symphony. He performs as violinist and violist on a regular basis, most recently as guest artist with the Appalachian Piano Trio (the wonderful Schumann performance that I was fortunate enough to hear), and annually with a group he formed called the Aloha Piano Quartet. If that weren’t enough, he also owns a local restaurant called Oki Momo Asian Grill. David does not describe his life as "busy," rather, as "full and complete." He notes there are no real shortcuts if you want to excel — something that is true whether performing a concerto or neurosurgery. Having music so firmly integrated into his life brings meaning and depth to it. And, in his own words, "I have no regrets about my path. It could not have been scripted any better." February 6, 2018 at 07:40 PM · Wow, very cool story, Diana! February 6, 2018 at 07:54 PM · love it! February 6, 2018 at 08:12 PM · Great story and very well told! Thank you for sharing this! February 6, 2018 at 08:47 PM · Wonderful story. And so true about the connection between music (playing an instrument) and science as far as discipline which prepares you for success in so many things in life. And what gets me all the time is that music is the first thing to go in schools when there's a budget problem. Music is the key to it all. February 6, 2018 at 10:20 PM · Well done! Excellent story told with energy and respect. February 7, 2018 at 12:22 AM · I am so appreciative of the wonderful comments! Writing is much easier when you start with such an interesting person as Dr. Yeh! And, Joe, I couldn't agree with you more. In fact, I'm quite certain the string program at the elementary level that Dr. Yeh participated in no longer exists. "The Death of Ivan Ilyich", cited in "Cancer Ward"). February 7, 2018 at 01:47 AM · Loved the story, Diana! Thanks for introducing us to David! February 7, 2018 at 03:58 AM · Beautiful multi talented compassionate person. Inspiring. Beautifully written! Thank you! February 7, 2018 at 04:31 AM · I went to med school...then quit to continue playing violin...was a member of the Symphony orchestra in Dominican Republic.....now no longer playing due to really bad neck and back pain. I am glad to hear about fascinating career...WOW...Travel...this is at the top....a Surgeon/Doctor and a violinist...Now someone who can really understand our tribulations...BRAVISSIMO! February 7, 2018 at 05:19 AM · In my small town, there is no high school orchestra, so the teenage string players play in the community orchestra. There is, however, a robust high school band and marching band. I believe that sports (including football) takes priority here, and a marching band is essential! February 7, 2018 at 09:58 AM · Great portrait of a remarkable person. Thank you! February 7, 2018 at 01:07 PM · Your writing perfectly brings together two great passions, music and healing. Nowadays, both subjects are often riddled with corruption and cynicism. Dr. Yeh is an inspiration to us. February 7, 2018 at 03:11 PM · Great story. Beautifully written. Thanks for sharing it. February 7, 2018 at 04:16 PM · Wonderful comments, of which Dr. Yeh and I are so appreciative! As Laurie pointed out in a private chat, we must all continue to fight for music education in our public schools. ("That is a fight that needs more soldiers, for sure!") And the comment about "music and healing" is particularly poignant. Thank you! February 7, 2018 at 05:55 PM · Great story and very inspiring. Dr. Yeh takes away the excuses we all like to make: "I'm too busy to...."
Thank you for an excellent story that blows the currently held belief that the STEM curriculum requires that schools eliminate arts and music. I had the pleasure to work in Bell Labs many years ago and knew that most of these highly educated scientists and engineers were also musicians. Maybe we should change the acronym from STEM to STEAM. Scientists recently discovered that our brains are made for music—that a deep musical appreciation is a foundational aspect of being human.1 Why do we have this special relationship with music, yet apes and other large-brained ‘higher’ animals don’t make, or even desire, music as we do? Like speaking and writing in grammatical language, music is a peculiar and distinctive trait of human beings only. Where did this mysterious habit and liking of ours come from? The scientists found that people with advanced dementia can suddenly and markedly improve in cognition when music they love is played back to them. Even when much of the brain is gone, music can wake it up, sometimes with truly ‘magical’ and inexplicable results. The sufferers ‘come back’ for that moment. The scientists who made this finding described music as like an emotional proto-language—for instance how a mother and father talk with their baby. The results were in many cases so astounding that the researchers themselves were readily swept up in the powerful emotions expressed. Interestingly, music appreciation appears to be embedded or wired into nearly all regions of the brain. The scientists found that music seems to be tied in closely with love and relationships—that there is a clear, powerful physiological effect of music on social bonding. They concluded that music is so important to our brain’s physical makeup that it is an indispensable part of what makes us human. February 8, 2018 at 10:26 PM · Diana, your superbly written article has reminded me of how much I both admire and like Dr. David. I’ve had the privilege of assisting him by finding the instrument and now he plays on, as well as in finding instruments and bows for other musicians he has supported. Further, I’ve had the privilege of hearing him perform as well as spending time (not enough) with him in a casual setting talking about all manner of things. In every circumstance he exudes the qualities of thoughtfulness, caring and extraordinary musical and medical intelligence illuminat d by your article. It has been and continues to be a profound joy to call him my friend. Few can claim to love, appreciate and support music more than he. February 9, 2018 at 02:29 AM · To 135.98, thank YOU for writing such a sweet note about the article and Dr. Yeh. Although you have clearly spent far more time with him, I also found him to be such a "thoughtful, caring, and extraordinary musical and medical" being. I greatly appreciate your comment!! February 9, 2018 at 03:35 AM · I am a mom with a young violin student. This article is inspiring to me. February 9, 2018 at 07:03 PM · Thanks Diana, this is a great article. I truly enjoyed reading it. Great job. February 10, 2018 at 11:27 AM · This penetrating and thoughtful article resonates with my own experience as a pediatrician in a challenging subspecialty, which I couldn’t have sustained without my secondary career as a professional tuba player. In the book, “Doctore Afield” (Yale University Press, 1999), there’s an enticing series of essays that illustrate a prevailing theme: one profession enables the other. In my case, I’m certain it allowed me to give care more meaningfully and to avoid burnout. February 11, 2018 at 04:47 AM · Dr. Newberger, Thank you so much for your thoughtful comments above (72.228.9.17). I look forward to reading the various works you cited. What you mentioned about your ability to "give care more meaningfully" was a consistent theme in my discussion with Dr. Yeh. Again, thank you for taking the time to provide additional food for thought! February 11, 2018 at 10:43 PM · Diana, you missed the most interesting part! What violin does a neurosurgeon play with? Perfectionist doctors tend to be very picky about their sound. February 12, 2018 at 01:35 PM · Hi, Tom! Not only did I miss it, I completely forgot to ask when I interviewed Dr. Yeh. But I found the answers for you now. Violin: Freeman Adams Oliver. Bow: Eugene Sartory. Viola: Paul Bailly. Bow: Samuel Allen for William Hill & Sons. February 12, 2018 at 04:04 PM · Diana, What a treasure you are. Thank you for this, I am going to share it with several others who know move freely across disciplines that much of the world sees as opposing. Terry. Fiddle Player. Retired B-747 pilot. February 13, 2018 at 01:48 AM · Thank you so much, Terry! The combination of a fiddle player and B-747 pilot is most intriguing! Thank you for your kind comments.